Get ready for the ultimate Disney experience at Disney On Ice presents Mickey's Super Celebration! Here's what you need to know to celebrate your favorite Disney memories in this commemoration of 90 years of Mickey Mouse. Grab your mouse ears and get ready for the ultimate interactive event honoring the “True Original” in Disney On Ice presents Mickey’s Super Celebration. Minnie Mouse, Donald Duck and Goofy join Mickey on a journey to discover his favorite memory of all time. Using Mickey’s Mouse Pad, show hosts invite fans to be a part of the action and help the gang as they venture though Disney stories, sharing memorable moments from treasured tales. For the first time in Singapore, see fearless Moana LIVE on ice, as she displays the courage to save her island on a high-seas adventure with the greatest demigod that ever lived, Maui. Continue the journey with your family to the wintery world of Arendelle as royal sisters Anna and Elsa discover true love is the most powerful magic of all and experience the mysterious magic of Fantasia as a Sorcerer’s Apprentice makes brooms come to life. “Live Your Story” alongside Disney Princess as they use perseverance, determination and hard work to inspire Mickey and children around the world to celebrate their favorite Disney memories in this commemoration of 90 years of Mickey Mouse. If you are not a Feld Priority Customer and would like to become one, sign up now for FREE at http://feldentertainmentpcsignup.com.sg/SG. By providing your details, you will be joining the Feld Priority Customer Program and will receive information about Feld Entertainment productions. For a limited time, you will be eligible to purchase tickets to Disney On Ice presents Mickey’s Super Celebration before they go on sale to the general public. 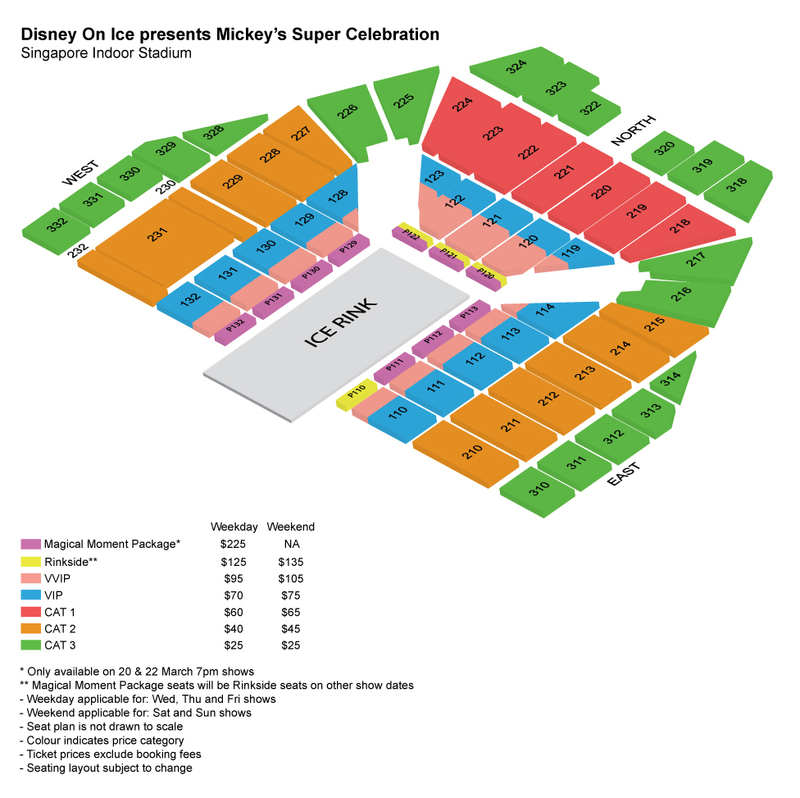 Booking fee for tickets S$30.00 and below: S$1.00 per ticket. Booster seats are available on a "first come, first served" basis from 1 hour prior to show up until show time. Booster seats are not guaranteed and are not included with the purchase of your ticket. All children under 12 years of age must be accompanied by a parent or guardian. No professional photography and videography are allowed.